All of our barns have been constructed using MDBarnmaster's famous modular design. 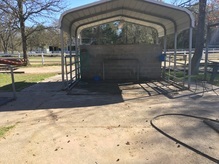 With a focus on safety and comfort for horses and their owners/riders, all stall walls are chew proof, kick proof, and fully flame retardant. Built for comfort, protection and security to our boarded horses, our structures are able withstand 120 mph winds and are built on frames of galvanized steel. 60 ft. covered lighted MDBarnmaster round pen – 4 ft. solid plus two rails to make 6 ft.
48 ft. covered lighted MDBarnmaster round pen – 4 ft. solid plus two rails to make 6 ft.